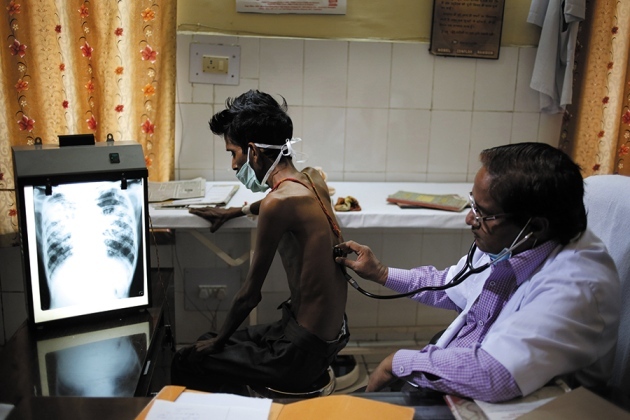 A physician examines a man with TB. Like the bacteria behind other common infections, Mycobacterium tuberculosis has become increasingly resistant to drugs. 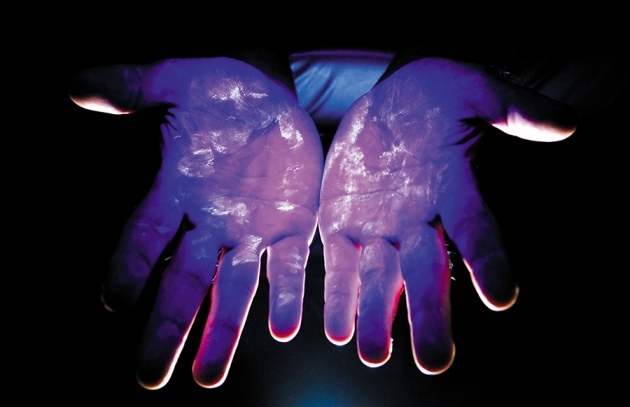 Clinicians have long known that microbes such as bacteria, viruses and fungi are becoming alarmingly resistant to the medicines used to treat them. But a global response to this complex health threat — commonly termed 'antimicrobial resistance' — requires engagement from a much broader array of players, from governments, regulators and the public, to experts in health, food, the environment, economics, trade and industry. People from these disparate domains are talking past each other. Many of the terms routinely used to describe the problem are misunderstood, interpreted differently or loaded with unhelpful connotations. On 16 March, the United Nations formed an interagency group to coordinate the fight against drug resistance1. We urge that, as one of its first steps, this group coordinate a review of the terminology used by key actors. Such an effort could improve understanding across the board and help to engender a consistent and focused global response. A 2015 survey by the World Health Organization (WHO) in 12 countries highlighted people's unfamiliarity with the language of antibiotic resistance2. Fewer than half of the nearly 10,000 respondents had heard of the term 'antimicrobial resistance'. Only one-fifth were aware of its abbreviated form 'AMR'. By contrast, more than two-thirds knew of the terms 'antibiotic resistance' or 'drug resistance'. A similar study published the same year of people in the United Kingdom — by the UK biomedical charity the Wellcome Trust — revealed comparable trends3. The interchangeable use of terms by the press and by scientists in publications and meetings is likely to be counterproductive in all sorts of contexts. Take food production. In recent years, different sectors have called on countries to phase out or abolish the 'antimicrobials' used to promote animal growth, to protect humans from increasing levels of drug-resistant bacteria4. But, by definition, antimicrobials include medicines that play a crucial part in sustaining current levels of poultry production worldwide by reducing the gut inflammation caused by coccidian parasites. Anticoccidial medicines have no effect on bacteria, and do not drive bacterial resistance in humans or other animals. So a demand to abolish all antimicrobials for growth promotion misses the point and could potentially harm food security. Simple, clear and unambiguous terminology would help to ensure that the global effort against drug resistance is focused on the greatest immediate challenge: the rise of drug-resistant bacteria that cause common illnesses, resulting from the high use of antibiotics by humans. It could also improve people's understanding and engagement. The Wellcome Trust study found that citizens either don't understand the language that scientists and the media use in relation to antibiotic resistance, or they resist engaging with the problem because they feel powerless to do anything about it. Words matter. A 2015 study5 of word use in social-media networks, for instance, indicated that the terms 'climate change' and 'global warming' have differing effects on knowledge and awareness. Likewise, a 2013 survey6 suggested that 'global warming' is more likely than 'climate change' to prompt Americans to support large and small-scale US efforts to address the problem — presumably because the phrase imparts a greater sense of personal threat. Similarly, use of the term 'second-hand smoke' in the past 40 years has been crucial to communicating the risks of smoking to the public7. And the decision to name the cause of AIDS as human immunodeficiency virus (HIV) in 1986 — instead of human T-cell lymphotropic virus (HTLV-III) or lymphadenopathy-associated virus (LAV) — helped people to understand that the disease was caused by a virus that harms the immune system. As such, it was crucial in tackling stigma and phasing out terms such as 'the gay plague', which had previously dominated communication around AIDS. Aggressive tactics to stop the spread of pathogens such as methicillin-resistant Staphylococcus aureus will benefit from a united front in terminology. The appointment of the United Nations Interagency Group provides an opportunity to apply the power of words to drug resistance. We urge this group to focus on three key issues. Drug-resistant infection. We propose that this be the overarching term used (in English) to describe infections caused by organisms that are resistant to treatment, including those caused by bacteria that do not respond to antibiotics. The WHO and Wellcome Trust surveys indicate that most people understand this term, and it is already in use for tuberculosis. (Medical practitioners, among others, commonly refer to 'drug-resistant tuberculosis'.) We also suggest that more-specific words such as 'antibiotic' or 'antifungal' are used in preference to 'antimicrobial' when referring to medicines against a specific type of organism. ffects and the chances of their being available for future generations. But the term is invariably used too narrowly.